I have a few mini-reviews for you today. Some items I have been sent to review and others which I have found and enjoyed and want to share with you. 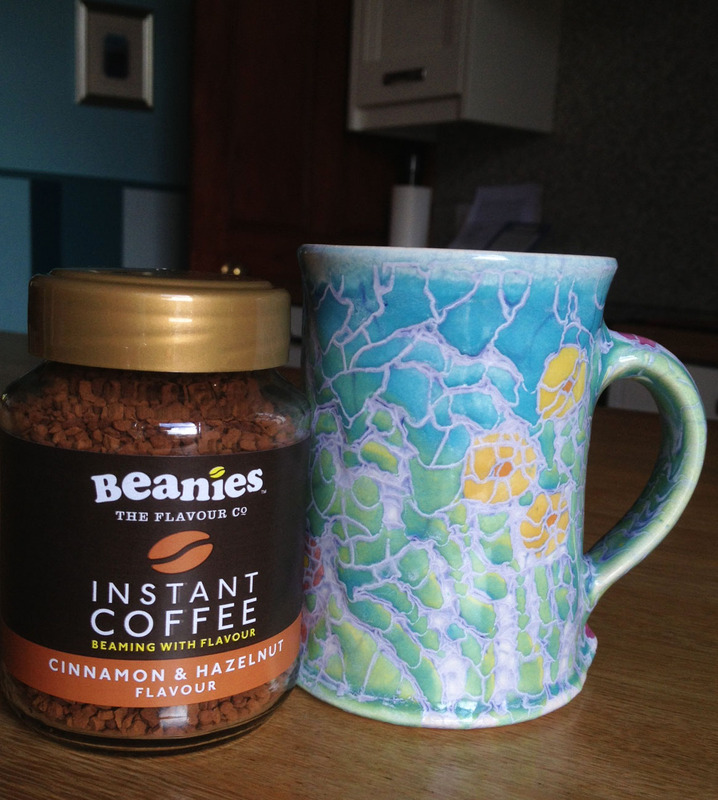 First up is Beanies Flavoured Instant Coffee. I actually thought it was ground coffee that I was going to be sent when I signed up for this review (should pay more attention!) not that I don't drink instant coffee because I do. Anyway, I chose the Cinnamon and Hazelnut Flavour coffee which I thought would go well with coffee and are flavours that I enjoy. I'm not sure whether it is because I drink my coffee without any sugar, but I didn't really enjoy this coffee, it tasted like it should be sweet and yet wasn't which I found a bit odd. On the plus side Beanies Cinnamon and Hazelnut Flavour Instant Coffee doesn't taste artificial and, I think, would be nice if you like hot milk and sugar in your coffee. 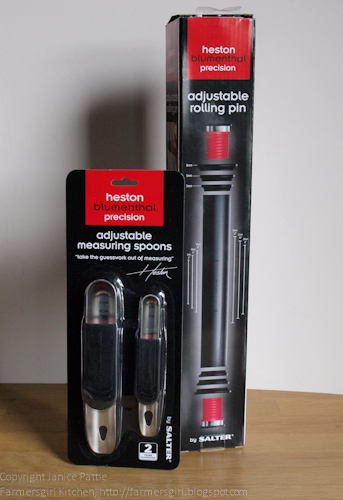 I was really excited to receive an adjustable rolling pin and adustable measruing spoons, Heston Blumenthal Precision items made by Salter. They are both well made and very modern and chic looking. 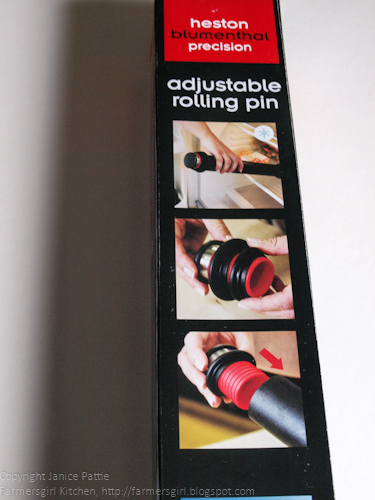 The rolling pin has three rings of different sizes which you can use to get your pastry to an even depth. 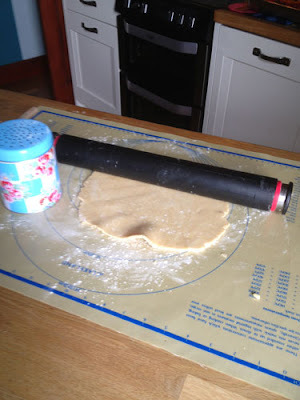 You simply unscrew the ends of the rolling pin and remove the two rings you are not using. 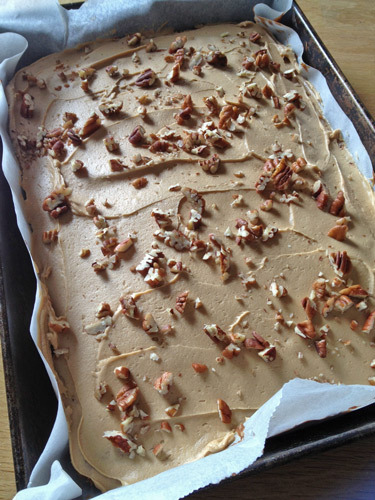 You can also put the rolling pin in the fridge and it chills down. I tried this and it worked well. 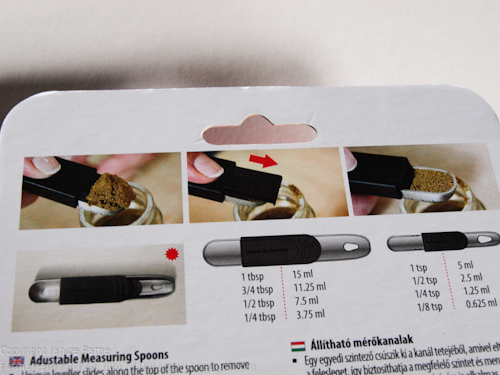 The measuring spoons are very nifty, they have a feature which enables you to 'level' off the spoonful so you have a precise amount, it takes a bit of practice to get the hang of altering the size and accurately levelling them but they do work well. They also nest into each other for storage. 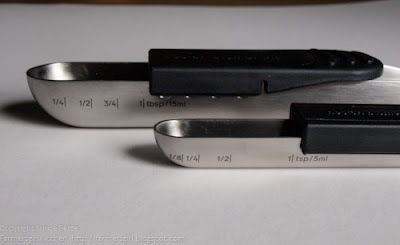 I quite liked the fact that the larger of the two measures allows fractions of a tablespoon, not something I've seen before I was rather disappointed that both of these items need to be hand-washed. 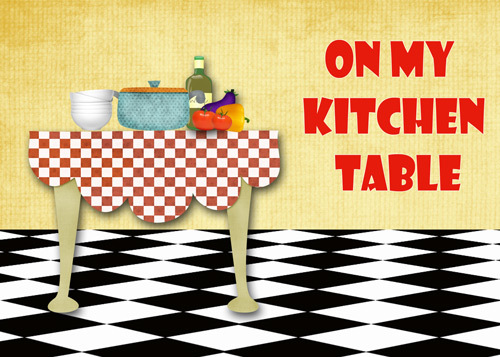 I prefer to be able to put everything in the dishwasher. Leave me a comment to tell me which product you have found recently and would recommend. 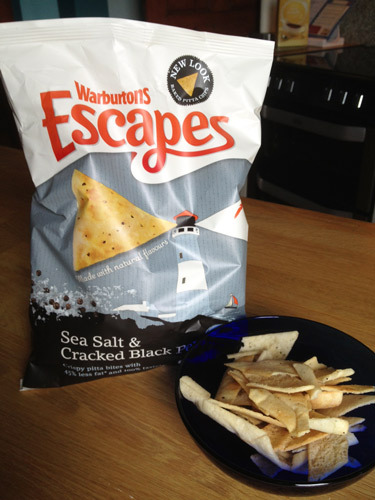 I love Warburtons Escapes, them and cheesy goldfish. Liking the Heston tools too! I've never heard of any of those products... I guess that's what I get for being on the other side of the world! 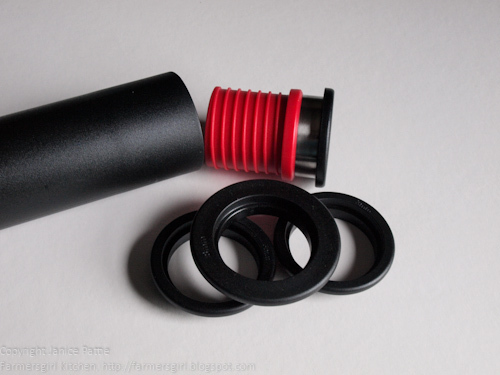 The Heston precision products look very useful. I often make tarts and flans that require even pastry, so the little attachments would eliminate the need to measure with a ruler! 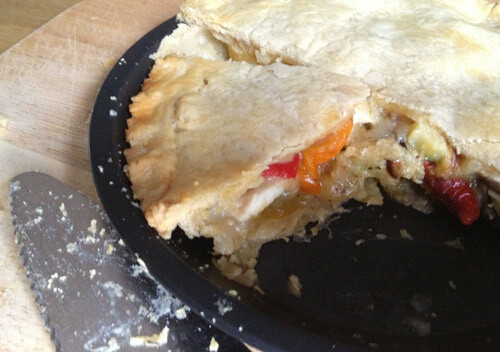 Definitely agree that baked pitta is amazing. I often make my own baked pitta bread in the oven as my local Lebanese market sells pita at 99c per piece! I don't think any of our snack brands have caught onto the idea of pre-packaged baked pitta though. Good on Warburtons! I am a bit of a gadget girl and love your rolling pin! I found a 'gadget' a long time ago that is just wonderful for use with ginger. It is made of pieces of bamboo cut into what looks like teeth on diagonals and each successive piece faces the opposite direction, so that instead of using a metal grater and grating the ginger with the flesh coming away and then because your metal grater is blunt it leaves the fibres to become longer and longer, this thing breaks the fibres and never gets clogged and thus you don't get ginger fibre stuck in you teeth. I found it in the little Asian store next to the chop sticks and bamboo wok scrapers. I like the sound of the adjustable measuring spoons but worry they would retain whatever had been measured- does the adjustable bit come off for cleaning? Nice idea though and on the rolling pin being adjustable too. They have been around a while but I adore Sainsbury's version of 'Popchips, we tried the salt and pepper ones last week and they didn't hang around very long! Oh! Corrie! I must look out for one of those. I live in China and have never seen such a thing. I never grate it on metal for the reason you say and usually end up chopping it fine and then bashing it up with my granite pestle and mortar. I'm going shopping to see if I can find one. Interesting set of products you've got here! I like the sound of the coffee, not sure about the rolling pin but the pita crisps sound great!